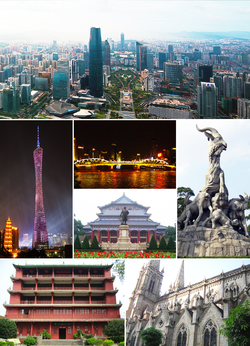 Frae top: Tianhe CBD, the Canton Tower & Chigang Pagoda, Haizhu Bridge, Sun Yat-sen Memorial Hall, Statue o Five Goats, Zhenhai Tower in Yuexiu Park, an Sacred Heart Cathedral. 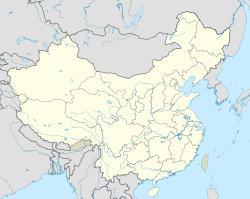 Guangzhou, an aa kent as Canton or Kwangchow, is a sub-provincial ceety an the caipital o the Guangdong province in the Fowkrepublic o Cheenae. It is ane o the five National Central Ceeties. Locatit in soothren Cheenae on the Pearl River, aboot 120 km (75 mi) northwast o Hong Kong, Guangzhou is a key transportation hub an tradin port. Guangzhou is the third lairgest ceety in Cheenae an soothren Cheenae's lairgest ceety. As o the 2000 census, the ceety haed a population o 6 million, an an urban aurie population o roughly 11.85 million, makin it the maist populous ceety in the province an the third maist populous metropolitan auriea in Cheenae. Some estimates place the population o the entire urban agglomeration as heich as 24.2 million, makin it the 2nt biggest urban aurie in the warld efter Tokyo. The Guangzhou govrenment's offeecial estimate o the ceety's population at the end o 2009 wis 10,334,500, an addition o 152,500 fowk frae the previous year. Includin registrated migrant population (present in the ceety 6 months or mair) ceety population is ower 14 mln. In 2008 Guangzhou wis identified as a Beta Warld Ceety bi the Global ceety index produced bi GaWC. ↑ 2014年广州市国民经济和社会发展统计公报 [Guangzhou Economic and Social Development Statistics Bulletin 2014]. Guangzhou Daily. 2015-03-22. Archived frae the oreeginal on 2016-03-12. Retrieved 2015-05-01. ↑ "MapMachine". Maps.nationalgeographic.com. Retrieved 2010-05-06. ↑ "Tourism Administration of Guangzhou Municipality". visitgz.com. Retrieved 21 March 2010. ↑ "Demographia World Urban Areas population projections" (PDF). Retrieved 2010-05-06. ↑ "Friendship Cities of Guangzhou". Retrieved 2010-03-25. Wikimedia Commons haes media relatit tae Guangzhou.